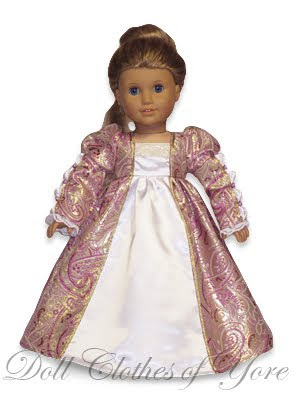 This beautiful dress reminds me of the Rapunzel costume in Disney's 'Tangled'! My little sister saw it and immediately begged me to do my blond doll's hair in Rapunzel's style! I wasn't able to do it, but she sat down and made her hair look great! Unfortunately, I wasn't able to get a picture of that style, but the dress is still beautiful! Out of all the dresses I have made, this one has probably been the hardest to figure out. 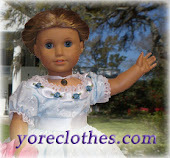 Slashes in sleeves are somewhat easy for adult clothing, but completely impossible for dolls. I spent hours brainstorming on just how to accomplish this, and I went on to make several mock-ups and experiments. I am so pleased with the results! It's not simple, by any means, but it looks great! I was also thrilled to find some beautiful glass beads that matched my brocade perfectly! I couldn't be more excited about this dress! New items are finally out! Many of these outfits have literally been in the works for 6 months. I am very excited about many of these, but especially the 'Annie Oakley' Dress. The skirt is made to look like the split riding skirts of the time, and the lace on the blouse adds just the right touch to make it feminine! More posts about the other dresses coming soon! I have been very busy preparing for my next Fall festival. I will be a vendor at the Chateau Morrisette Black Dog Wine and Classic Rock Music festival. It is in Floyd, Virginia, if you live in the area and want to stop by! Because of the festival, I have many new outfits that I have not been able to post on the internet. Here is a list of the names of the new outfits- can you guess what they might look like?